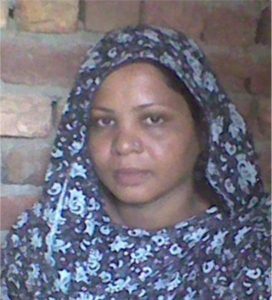 Asia Bibi (53) is a Christian farm labourer from Punjab province in northeast Pakistan. She was imprisoned in 2009 and became the first woman to be sentenced to death under Pakistan’s blasphemy laws. LATEST NEWS (29 January 2019): The Supreme Court in Islamabad upheld its acquittal of Asia Bibi last October. The decision should mean Asia is free to leave the country. Her daughters have moved to Canada and are living in a secret location. On 14 June 2009, when picking berries in the fields with three Muslim women, Asia went to fetch water. The women refused to drink from the bowl she brought, saying the water had been brought by an “untouchable” and was “unclean”. After an argument, one of the women told the local imam that Asia had said: “Jesus Christ died on the cross for me – what did Mohammed ever do for you?” The imam filed a blasphemy case, local men beat Asia and the police took her into custody for protection. Asia said she had not made any blasphemous remarks, and her lawyer argued that the allegation was made to target her because of her Christian faith. She had been under pressure from Muslim farm workers to renounce Christianity and convert to Islam. In November 2010, Asia was convicted of blasphemy and sentenced to death. She lost her appeal at Lahore High Court in October 2014, but in July 2015 the death sentence was suspended pending an appeal hearing at the Supreme Court in Islamabad. This appeal was due to be heard in October 2016 but was was adjourned when one of the three judges recused himself. Asia’s Supreme Court hearing was eventually heard on 8 October 2018, and on 31 October the judges announced their verdict, acquitting Asia and ordering her release from prison. Over the years, Islamists have persistently called for Asia’s execution, and Muslim clerics put a bounty on her head. Two politicians who supported her and spoke out against Pakistan’s blasphemy laws have been assassinated. Asia is married to Ashiq Masih (59) and they have two daughters, Esha (20) and Eisham (18). Ashiq, a brick labourer, also has three children from a previous marriage. After Asia was accused of blasphemy, the family was forced into hiding to avoid attack, and had to move several times. Asia’s family is one of about three Christian families from Ittanwali village in Punjab’s Sheikhupuru district. 14 June 2009 Asia Bibi’s fellow farm labourers accused her of blasphemy. She was beaten and taken into custody. 8 November 2010 In Sheikhupuru District Court, at the end of a trial lasting more than 16 months, judge Muhammed Naveed Iqbal convicted Asia of blasphemy and sentenced her to death by hanging. 4 January 2011 Punjab Governor Salman Taseer was shot dead because he had visited Asia in prison and had spoken out against the misuse of the blasphemy laws. The assassin was his bodyguard, Mumtaz Qadri, who was publicly hailed as a hero. 2 March 2011 Minorities Minister Shabhaz Bhatti, the only Christian in cabinet, was shot dead by the Taliban. He had been an outspoken opponent of the blasphemy laws and had supported Asia Bibi. June 2013 Asia was moved from Sheikhupura District Jail to Multan Jail, more than 290 km from her home. Because of fears that she would be attacked or poisoned, she was put in solitary confinement in a windowless cell and allowed to cook her own food. Shagufta Kausar is also being held in Multan Jail. 16 October 2014 Lahore High Court rejected Asia’s appeal and upheld the death sentence. 22 July 2015 Three Supreme Court judges suspended Asia’s death sentence and agreed to a full hearing, at the Supreme Court in Islamabad, of the appeal against her conviction for blasphemy. 29 February 2016 Salman Taseer’s assassin Mumtaz Qadri was executed. The judge who passed his sentence was forced to leave Pakistan because of extremist threats. A large shrine was built over Qadri’s grave in Islamabad. 13 October 2016 Asia’s Supreme Court appeal was due to be heard, but was adjourned because one of the three judges, Iqbal Hameedur Rehman, recused himself, claiming a conflict of interest – he had been on the bench that heard Mumtaz Qadri’s case. Shortly after, he resigned from his position. Thousands of police had been deployed in Islamabad, as Islamists were threatening to riot if the court overturned Asia’s death sentence. The Supreme Court did not set a new date for the appeal. January 2018 In late January, Asia’s lawyer Saiful Malook told Voice of the Martyrs staff that she was healthy and in good spirits. She was alone in Multan jail, with a female prison guard present at all times to provide security. The lawyer said he was working with the court registrar to fix a new hearing date. 21 April 2018 Chief Justice of Pakistan Mian Saqib Nisar told Asia’s lawyer Saiful Malook that the Supreme Court would hear her appeal against her blasphemy conviction “soon”, and that he would preside over the bench. Justice Nisar told the lawyer that all criminal appeals before the Supreme Court would be decided by July – this would include Asia’s case, being a criminal appeal. 8 October 2018 Chief Justice Mian Saqib Nisar, Justice Asif Saeed Khosa and Justice Mazhar Alam Khan Miankhel of Pakistan’s Supreme Court heard Asia Bibi’s appeal against her conviction for blasphemy. The judges highlighted discrepancies in the statements of prosecution witnesses and announced that they would reserve judgment but did not give a date for the announcement of their verdict. 31 October 2018 Pakistan’s Supreme Court acquitted Asia Bibi and ordered her immediate release from prison. However, the government gave in to the demands of Islamist extremists who protested across the country, barring Asia from leaving Pakistan and agreeing that it would raise no objection to a review petition against the Supreme Court decision sought by the imam who filed the original complaint against Asia in 2009. 7 November 2018 Asia Bibi was released from Multan prison and flown to Islamabad, capital of Pakistan, where she is being held under heavy security. 29 January 2019 The Supreme Court in Islamabad upheld Asia’s acquittal. The decision paves the way for her to leave the country. Her daughters have moved to Canada and are living in the capital, Ottawa. Read more about the persecution of Christians in Pakistan.